The second breast cancer quilt is on the quilting machine. I have most of it done. It was not very cooperative. I don't know if it was all the glitter glue blocks or my bobbin case on the HQ16 is having issues. My bobbin thread would keep coming out of the "hole" of the bobbin case. 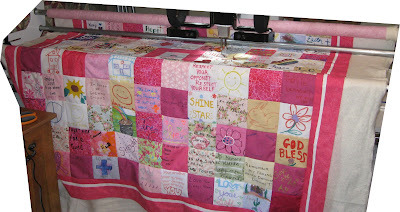 I would have to pick out some of the design, back up the quilting design and start again. This one was definitely a challenge but worth it. I also created the binding for the quilts on Sunday. I've machine sewn the binding on the first quilt and I am in the process of hand sewing it to the back. I should make some progress on this tonight. Last night we went to DH's Aunt's home for dinner. It was such a great time! It was like something out of Better Homes and Gardens. It was so relaxing after a rough couple of days. We are hoping we have had our fill of difficult times but only one person knows what he has in store for us.